Contact our PartyMojo office at 65696992 / Sales 81606655 / Yolanda 81606622 to enquire now! Drop us a quick email at [email protected] today for your very own popcorn chicken live station! Who doesn’t love these tiny bite sized chicken! 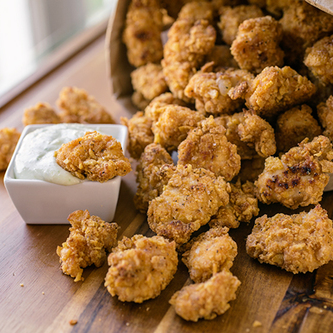 We can almost promise you that all of your guests, toddler, teenager, adult, mommy, daddy, grandma and grandpa would love PartyMojo’s popcorn chicken; there’s no reason not to love it! Furthermore, we have various sauces for you to dip the popcorn chicken! What’s required from me if I hire PartyMojo’s Popcorn chicken station? Simply provide us a table and a powerpoint and we’re good to go! Table are available for rent at only $10! Are the popcorn chicken Halal? Yes! Our ingredients are halal!